Sun damage can be tricky to treat, no matter how new (or old!) it may be. Some can reside deep in the skin, and different types can be treated in varying ways. Here are the most effective ways to treat sun-damaged skin. The first step to reversing old sun damage, believe it or not, is to prevent new sun damage. Your body is working hard all the time to get rid of bad cells and damaged cells, and to replace them with newer, healthier cells. If you don’t lower the burden of new damage, your body will be too distracted to be able to clear out the old. So if you are going to be working on improving an area (face, neck, chest, shoulders, hands) with any of the below techniques, don’t forget: SPF 30 or higher sunscreen every day. “Intense pulsed light, or broadband light, sometimes called photo facial, when treating the face, is a ‘laser-like’ technique that uses a device that flashes a band of different wavelengths of light against your skin,” explains Jessica J. Krant, M.D., M.P.H., founder, Art of Dermatology in New York City. This helps brown spots fade and helps with that annoying underlying redness from damaged surface blood vessels. It’s an excellent method for face, neck, chest and hands when performed in a series. “However, this device does have the ability to cause burns and permanent scarring, so make sure whoever does it is not only licensed and trained for it, but also very experienced,” cautions Krant. You may know the PicoSure for its tattoo removal laser technology, but it is also known to treat benign pigmented lesions and reverse skin damage from too many sunburns or not enough sunscreen over the years. “One of the reasons the PicoSure is so ideal for brown spots, is that it doesn’t affect the surrounding skin like other treatments can. Patients are usually left with clear skin that isn’t discolored and matches the rest of the treatment area,” said Dr. Roy G. Geronemus, M.D., Director of the Laser & Skin Surgery Center of New York. Vitamin A-derivative creams are sold both over the counter (retinol) and by prescription (tretinoin, Retin-A®, Renova®). “Prescription tretinoin is the only medication FDA-approved specifically for the reduction of fine lines and wrinkles,” says Krant. All other anti-wrinkle creams, no matter how fancy they seem, are cosmeceuticals, creams that ride the line between cosmetics and medications. There are many plant-based antioxidants (“anti-oxidative cell damage”) on the market, from those sold as ingredients in basic moisturizers (alpha hydroxy acids) all the way to extremely expensive cosmeceutical creams made from “rare” ingredients (Dead Sea minerals). “While many companies have done extensive internal research showing biological effects on the skin, they do not want to publish this information because any substance that truly does affect the skin’s biology would technically be a drug, and require FDA-regulation and testing: very expensive and limiting in today’s multi-billion dollar beauty market,” says Krant. 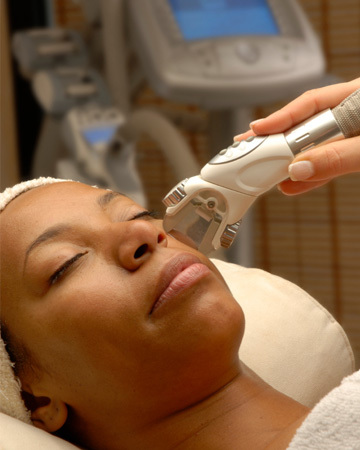 Lasers are popular for many skin issues, and many different aspects of sun damage. “Fractionated, ablative, non-ablative and continuous lasers have all been used for reversing discoloration, dullness, wrinkles, redness and thinning of the skin,” says Krant. Like IPL, lasers can easily burn and scar if used improperly, and the temporary damage when used properly can still increase the risk of a skin infection. “This uses CryoStem Cell technology which has an abundance of frozen collagen, EFAs, minerals, vitamins, elastin and hyaluronic acid to rebuild old or damaged cells and produce new skin cells which will even out skin tone and give you a more youthful look,” says Maria Rianna-Boyajian of White Tea Med Spa in New York City.